(Magneto: Not a Hero#4 (fb) - BTS) - Christopher Bach, leader of the anti-mutant group Humans Now, approached mutant teleporter Astra with a tempting offer: resurrect her Magneto clone Joseph, have him pose as Magneto and kill a few Humans Now members. Bach figured this would help his cause gain more attention, while Astra couldn't pass up an opportunity to pester her old boss Magneto, who in recent times had gone straight. Accepting his offer, Astra was provided with all the money and manpower she needed to restore Magneto's former arctic base, where Joseph had sacrificed his life to stop his counterpart. (Magneto: Not a Hero#3 (fb) - BTS) - After returning Joseph back to life by reforming his body, Astra figured she might need more firepower. That's why she created copies of the original members of the Brotherhood of Evil Mutants (Mastermind, Quicksilver, Scarlet Witch and Toad), using the same alien technologies used in the creation of Joseph. However, these clones were abominable looking. See comments. (Magneto: Not a Hero#1) - Honoring the deal she made with Bach, Astra travelled with Joseph to a Humans Now rally where he killed forty members, dressed as the mutant master of magnetism. Astra kept the other Brotherhood members in reserve, though. When Avengers Captain America and Iron Man wanted to arrest the real Magneto, they were persuaded by the X-Men's leader Cyclops to hold off until Magnus had been given a chance to find the real killer. With the help of Emma Frost and a machine similar to Cerebra, Magneto tracked down Astra and Joseph's whereabouts. (Magneto: Not a Hero#2) - When Magneto located Astra's secret base in an abandoned factory in the Appalachian Mountains, he was escorted by Astra's guards to their lair. 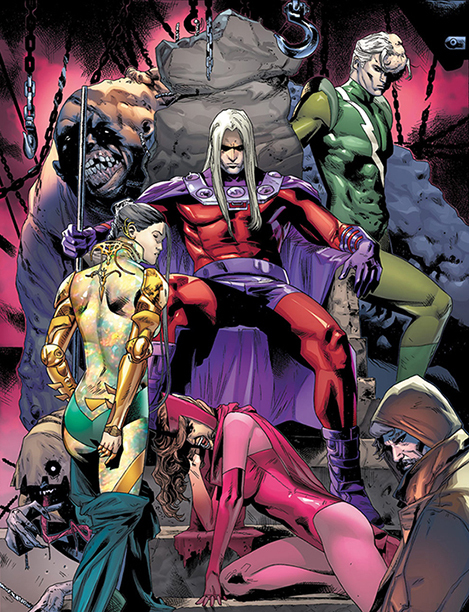 When Magneto angered Joseph by calling him nothing more than a clone, he was struck down and attacked by the clones of the original Brotherhood of Mutants. (Magneto: Not a Hero#3) - During the opening moments of the battle, the Blob tried to grab Magneto, who defended himself by plunging several metal pipes through the clone's head, leaving him severely injured. Next, Quicksilver punched his "father" with all his might, but his speed didn't save him from Magneto killing him with a magnetically hurled car. Mastermind's clone used his lifelike illusions to make Magneto believe he was back in the Nazi deathcamps of his youth. He broke free from the illusion after Toad hit him, who Magneto initially mistook for his mother. Angered by the experience, he killed the clones of both the Scarlet Witch and the Toad, while injuring Astra by slamming a metal spear through her chest. Watching on, Joseph commented how glad he was to see the return of the old Magneto. He then took his leave by magnetically dropping the roof on Magneto and Astra. Surviving the incident, Magneto returned to Utopia with Astra where she received medical attention before she was put in the X-Brig, the X-Men's private prison. (Magneto: Not a Hero#4) - The remaining members of the Brotherhood (Joseph, Blob & Mastermind) decided to attack a huge Humans Now rally at the Chicago Millennium Park. When Magneto learned of this, he felt it necessary to take care of the matter himself and not involve the X-Men. He visited Astra in jail and promised to let her go, if she teleported him to Chicago. Astra agreed to the terms, but left immediately after bringing Magneto to Chicago, not sticking around to see "her boys" fight. Astra had already left by the time Magneto downed a plane, instantly killing the Blob and Mastermind. After an extended battle, Magneto managed to defeat Joseph, which indirectly resulted in the death of Christopher Bach as well. (Magneto: Not a Hero#4 - BTS) - Joseph was imprisoned in the X-Brig. With all the cloned Brotherhood of Mutants dead, the team was disbanded. Comments: Created by Skottie Young, Clay Mann and Seth Mann. It was never explained just what caused the Brotherhood clones to turn out so misshapen, while Joseph came out perfect. Perhaps the relatively small window of opportunity Astra had to create them, forced her to cut corners or prevented her from working out the inevitable kinks in the process (it is alien technology, after all). The presence of Blob among Astra's Brotherhood of Evil Mutants is surprising, given the fact Fred J. Dukes never joined Magneto's band. Possibly Astra included him to off set the lack of raw physical strength among the original members, or maybe she was already aware of him during her brief time with Magneto's Brotherhood. 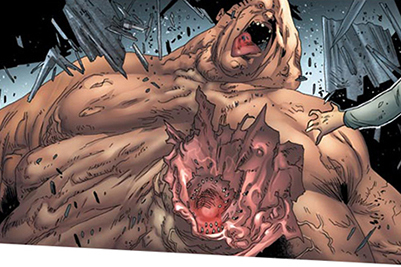 Blob first appeared in X-Men I#3, an issue before the original Brotherhood of Evil Mutants was introduced, it's very possible Magneto considered him a potential recruit. The powers of the cloned version of the Blob resembled the original, his extreme amount of pliable body mass granting him superhuman strength and an impenetrable skin. This clone however had some extra features the real Fred Dukes lacked. For starters, he was a great deal bigger than the original (his hand was as large as Magneto's entire body). Beyond that his stomach had a mouth that could eat and/or spit out enemies. 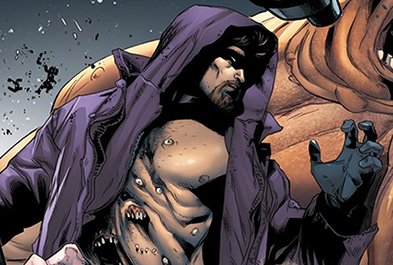 The Blob plunged himself at Magneto in the Brotherhood's initial attack on Magneto, grabbing him with his enormous hands. Magneto used his magnetic powers to drive several metal pipes through Blob's head. This didn't stop the giant as he fed Magneto to the mouth in his stomach that eventually spat him out, propelling Magneto through the air at incredible speed. After Magneto managed to defeat and kill most of the Brotherhood Blob, Mastermind and Joseph reemerged during an attack on Millennium Park in Chicago. This time however Magneto succeeded in killing the Blob and Mastermind by dropping an airplane on the venue. The cloned version of Mastermind seemed to possess the same powers and physical proportions of Jason Wyngarde. However, his upper body sported several extra eyes and a few mouths and stray teeth, indicating the cloning process did not go perfectly. When the Brotherhood first attacked Magneto it was Mastermind who used his powers to create an illusion of the Nazi death camps where Magneto was forced to spend most of his early years. These illusions were so realistic, Magneto believed the clone of Toad to be his own mother. After Mastermind dropped the charade and Magneto realized what happened he lashed out at Toad, impaling him with a steel rod. Mastermind was lucky enough to momentarily escape Magneto's wrath, and joined Joseph and Magneto during their attack on Chicago's Millennium Park. This time however, Mastermind could not cheat death when Magneto dropped an airplane on him. The cloned version of Quicksilver possessed the same powers as the original Quicksilver, albeit with a body plagued by abnormal growths on his head and stomach. Also, his hands resembled claws. When Joseph and Astra introduced the Brotherhood to Magneto, Joseph ordered Quicksilver to strike his "other father". He started punching Magneto with all the speed he could muster, until Magneto had a moment to focus his powers and killed his "son" by slamming him through the nearest wall with a car. 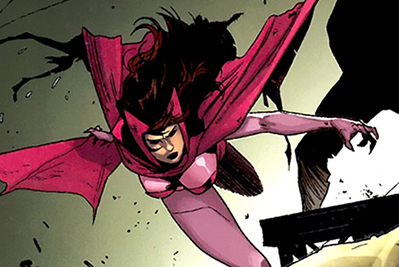 The cloned version of the Scarlet Witch probably possessed the same powers as the original, however we can't be sure as she was only seen flying. This clone was the only Brotherhood member with no visible defects, but it appeared she was unable to speak. In the initial attack on Magneto by the Brotherhood, the clone of the Scarlet Witch didn't seem to want to fight her apparent father as she kneeled down besides him to care for him. Unimpressed, he grabbed the Scarlet Witch and snapped her neck. The cloned version of Toad possessed the same long tongue as the original. Beyond that, its appearance more closely resembled that of a lizard than a frog, especially considering he had a maw full of razor sharp teeth. When the Brotherhood first attacked Magneto, the Mastermind clone used his power to make Magneto believe his was still in the nazi camps. 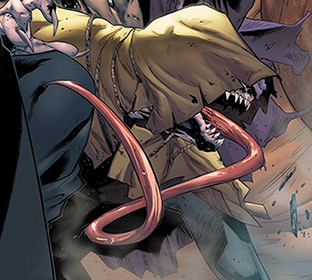 As part of the illusion, Magneto mistook Toad for his mother, allowing the villain to get close enough to wrap his prehensile tongue around Magneto's throat. This broke Mastermind's hold over him, which meant Toad was dead moments later with a steel rod shoved through his body.